After weeks of shuttle diplomacy, speculation and contradictory signals, the Economic Community of West African States (ECOWAS) now looks to have the backing of the Malian government for a major troop deployment in northern Mali. ECOWAS is still seeking support from the UN Security Council, whose members are divided on the issue of military intervention. Internal ECOWAS documents point to a draft plan, outlining provisional troop numbers, budget and time-frame. In Bamako, supporters of an ECOWAS deployment are adamant that a strong outside force is crucial if Mali wants to “recapture” the north, ousting the Islamic movements which took over the area six months ago but have dominated an extensive criminal economy for years. Who is in control in the north? When the rebellion in northern Mali broke out in January, it was the Tuareg National Movement for the Liberation of Azawad (MNLA) that quickly out-manouevred a demoralized, ill-equipped army, capturing large swathes of territory. The MNLA's demands for an independent state carried strong echoes of previous insurgencies but its combatants and fledgling administrations were rapidly supplanted by radical Islamic movements. For Bamako, the main enemy no longer had a separatist agenda, but a rigid commitment to a Salafist Islam largely alien to Mali. 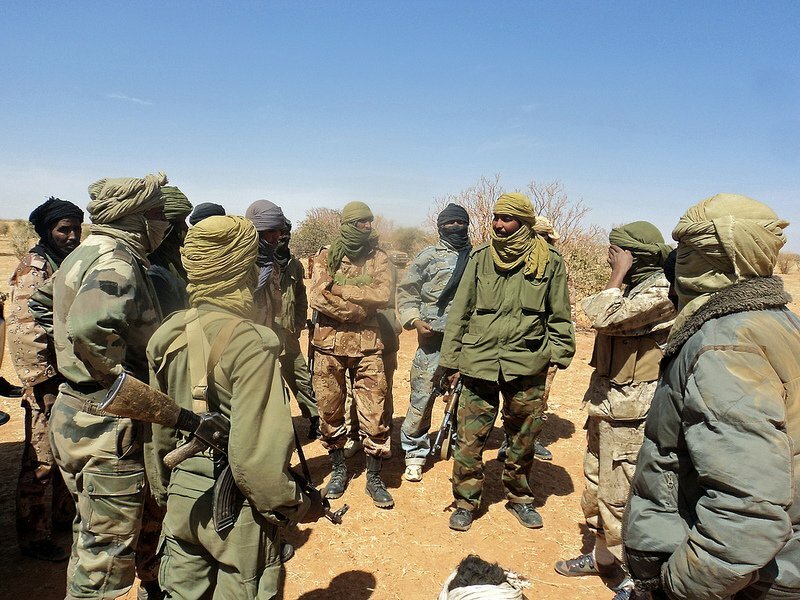 At the same time, Al Qaeda in the Islamic Maghreb (AQIM), widely presented as the controller and financier of the Islamic radicals in the north, has extensive trafficking and kidnapping networks there - reportedly secured with the discreet connivance of sections of the Malian military and Algerian security forces. While there has been endless speculation about the size, military strength, internal structures and support networks of the three main movements (Ansar Dine, the Movement for Unity and Jihad in West Africa - MUJAO, and AQIM), hard information has often proved elusive. Visitors to the north suggest AQIM's leadership is very much present, but extremely mobile, individual warlords frequently shifting location, while MUJAO’s strength is allegedly growing, much of it fuelled by non-Malian West Africans. Regional mediation efforts have yielded little. ECOWAS's designated mediator, Burkina Faso President Blaise Compaoré, was much criticized in Mali, seen as pro-Tuareg and taking unilateral initiatives without consulting the transitional government in Bamako. Peace initiatives from Mali have been exploratory. Among those to have headed north was the Guinna Dogon (GD) movement, representing the Dogon ethnic community, mainly based around Mopti and Djenné in the north. "We went as cousins", GD president and Foreign Ministry adviser Mamadou Togo told IRIN. Both "occupiers and those being occupied" wanted peace and dialogue, but he found AQIM and MUJOA to be dominated by non-Malians, who seemed to have little understanding of the country, he said. Togo found Ansar Dine veteran Tuareg leader and long-term negotiator Iyad Ag Ghali more approachable, but still with a wholly unrealistic agenda. "Iyad wants Sharia", Togo explained. "The Islamists argue that 95 percent of Malians are Muslims, so Sharia must be imposed now. How do you negotiate with that?" What are the human rights concerns? In a 23 September report Human Rights Watch (HRW) warned that under the control of Islamic radicals "stonings, amputations and floggings have become the order of the day in an apparent attempt to force the local population to accept their world view." There is evidence of strong cohesion between the three movements on imposing Sharia, with courts now sitting regularly in Timbuktu and Gao, according to senior HRW Africa researcher Corinne Dufka, who also confirmed major recruitment drives of children and adults. Could intervention make matters worse? The reports of excesses in the north have inevitably strengthened the calls for prompt, decisive military action, with warnings that the longer the Islamists are left to their own devices, the more difficult they will be to dislodge. Dufka of HRW warned of a conflict where humanitarian law would get little recognition, emphasizing that aerial strikes and drone attacks were likely to feature. She also warned of a "fratricidal" element to the conflict, with armed groups like the northern militia group Ganda Koy (made up of ethnic Songhai and traditionally violently opposed to the Tuaregs), coming into the picture. Many Tuareg refugees told IRIN they were too afraid to return home because they would be targeted in attacks. Dufka also expressed concern about the professionalism of the Malian military. An investigation has been promised into the killing of 16 Malian and Mauritanian Islamic preachers from the Dawa movement at Diabaly, 400km northeast of Bamako on 8 September, an incident which has further complicated Mali's relations with Mauritania and drew a furious response from Islamists in the north. The International Crisis Group (ICG) has warned in a recent report that "all scenarios are still possible in Mali," including a wave of attacks, major social protests, or another coup. The ICG urged the international community to help heal divisions and build strength in Mali’s military, re-establish stalled development aid, and give the crisis a much higher profile. Is ECOWAS capable of effective intervention? Diplomats, who see a conflict as likely if not yet inevitable, suggest an intervention begun in haste will be catastrophic, not least because serious questions remain about ECOWAS's own capacity. Key member states like Senegal appear lukewarm about intervention in Mali. Nigeria, facing its own Islamic fundamentalist threat in the shape of the radical Boko Haram movement, may face domestic pressure not to commit troops. Few available ECOWAS troops have combat experience in a desert. Mauritania, which has criticized Mali in the past for being “soft” on “Islamic terrorism”, and has sent its own troops into Mali on counter-insurgency operations, is not an ECOWAS member. Neither is Algeria, accused by many Malians of spawning the Jihadist movements and their accompanying kidnapping and trafficking networks, which have played such a destructive role in northern Mali. Neither the Malian army nor ECOWAS will be able to tackle the influx of arms and soldiers from Libya to northern Mali through southern Algeria and northern Niger, warns the ICG without “clear involvement of the Algerian... authorities”. ECOWAS has made it clear that it needs and expects strong backup from outside, particularly in airlifting troops to the combat zones, promoting speculation that France and the USA could play critical roles. Both, predictably, are downplaying their importance. France has serious concerns about French hostages still held by Islamic radicals. The US formally suspended military engagement with Bamako after the National Committee for the Recovery of Democracy and the Restoration of the State (CNRDRE), headed by US-trained Captain Amadou Sanogo, took power on 22 March. What about the new government in Bamako? Military intervention is further complicated by the power vacuum in Bamako, where the government has no electoral mandate and where none of the three actors sharing power has sufficient legitimacy, say observers. Critics warn that the restoration of democracy has barely begun. The government formed by President Dioncounda Traoré in August under outside pressure and headed by Prime Minister Cheikh Modibo Diarra, remains a weak, compromise administration, described by one diplomatic observer as, at best, "an imperfect construct, but one that could move forward". Other concerns include continued support for Cpt Sanogo, the military's retention of key ministerial portfolios, including Defence, Home Security and Territorial Administration; and a history of serious human rights violations, with security forces targeting critical journalists and the reported torture and disappearance of soldiers hostile to the military junta. "This is not a normal democracy; this is Mali post-coup," said a Bamako-based analyst. Relations between ECOWAS and CNDRE have been volatile, with Sanogo and his political allies wanting to keep foreign troops outside Bamako and confining ECOWAS’s role to logistics and training. The current civilian administration is more accepting, with Traoré issuing an invitation for military intervention. But there is no evidence yet of a more robust approach from the Malian military, with reports instead of dangerous schisms, particularly after the “Red Berets” - Mali’s elite force - were accused of leading a counter-coup attempt in late April. Timbuktu parliamentary representative Sandy Haïdara is adamant Mali cannot go it alone. "We are from the north and we know our army cannot do this," he told IRIN. "They will need help".